There has been significant research going for Green Energy Solution. The objective of this project is to generate energy from the moving traffic on the road. The horizontal roller is connected to the stepper motor. 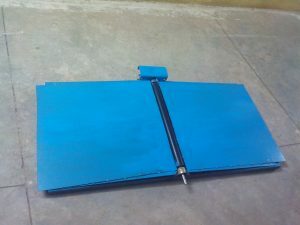 Whenever vehicles pass through the road, the horizontal roller will rotate, the stepper motor will convert mechanical energy into electrical energy. Generated electrical energy is used to charge DC battery. During the night time street lights are run through the charged DC Battery. In this project, we are generating electrical power as non-conventional. The non-conventional energy system is essential at this time for our nation. Non-conventional energy Generated electrical energy from the busy road. For this project the conversion of the force energy into electrical energy. The control mechanism carries the gear, D.C generator and lights.